SEO is an exciting marketing field because it is the point where you can engage with your customers based on their needs through search engines like Google and Bing. SEO is the art of understanding how to interpret data, the science of optimizing content based on that data, and the skill of empathy to understand the human-element of online searches. In our latest Unwrapping the Secrets of SEO, we look at how user intent should always inform SEO strategy. The internet is a vast ocean of content; determining where and how to find an individual drop of water is incredibly difficult for the uninitiated. While there are proven tactics to boost online rankings, the real issue that many businesses struggle with is driving qualified traffic to their website. Since Google is the conduit that you can use to get people to your website, you need to attract qualified customers based on their need. People engage with your brand to conduct economic exchanges, so understanding the questions, problems, and needs of your customers to boost sales and reach your business goals. Modern day SEO is continually changing based on the needs of your customers, the actions of your competitors in the market, and the goals of your business. In today’s world of SEO marketing, companies need to adapt their online messages based on what customers are searching for and understand their intent based on specific search queries. In the past, SEO was focused on “gaming the system” by manipulating technical aspects of search engines. Today’s SEO is a dynamic of art and science blending technology with the needs of users. SEO is focused on human behavior & customer needs. If you want your business to thrive, then you need to understand how and why people use specific keywords. The focus of SEO should be on your audience and not about your business. Bragging about your business is counterproductive because you want always to want to make your customers the hero. The goal of SEO is to drive qualified traffic and sales for your business. While it is exciting to drive tons of traffic to your site, if 90% of visitors are not eligible then your business is wasting a lot of money and time. SEO is part of a holistic strategy to help your business grow. Since SEO is only one aspect of a comprehensive marketing strategy, your company should build an SEO strategy around your business goals. The only way that SEO works for your business is if you can rank for specific keywords that are relevant to your audience and drive the bottom line of your business. These keywords need to be optimized on pages with relevant information, and pages are only relevant if it address specific needs of customers. 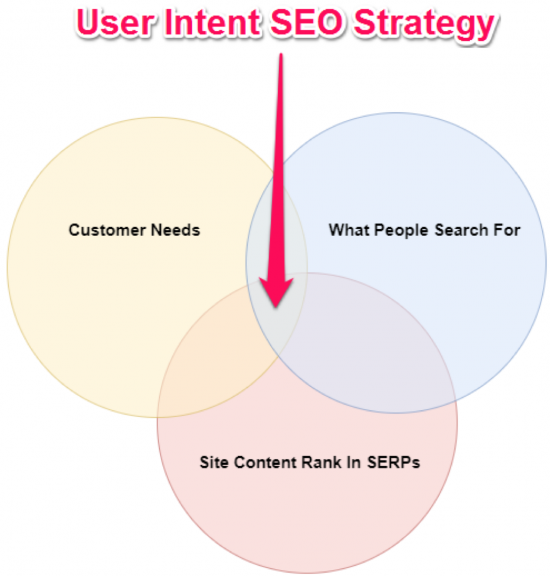 Now that we understand what user-intent SEO is, let’s take a look at three of the most important aspects that influence a marketing strategy. Your customers take a long and complicated journey before they purchase with you. This journey includes identifying a need, researching solutions and making a purchase. Awareness: Here your customers are working to identify what they need. They often don’t have specific questions and are working to clarify awareness about their needs. Comparison: As your customer researches their need, they will begin comparing solutions. Queries are informational and solution-focused, and customers will filter down potential products/services based on their needs. Consideration: Customers will drill down potential option and now they are informed about their problem and options available. Customers often want to learn about features at this point to understand the best solution. Conversion: The customer is ready to buy because they have done plenty of research to understand solutions available to them and weighed all options. To understand how we can leverage powerful tools to understand the intent of our customers, let’s imagine that we own an air conditioning company. If we want to create content for our air conditioning repair business, then we need to think about the type of information people need in relation to their needs and other elements. Taking this approach will allow us to develop the best content for our customers at different points of the customer journey. The trick is understanding the Search Funnel of the topic you’re researching. We can see that there are plenty of content ideas for the Consideration phase of the customer journey, we can start to think about the different types of content to users based on where the customer is in their journey towards a sale. 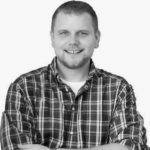 This means that we can integrate the stage that our customers are at into our copywriting services and strategy to deliver the best content across our site. Here is a quick outline of some topics and content types that we can work on from the information that we discovered in the previous step. 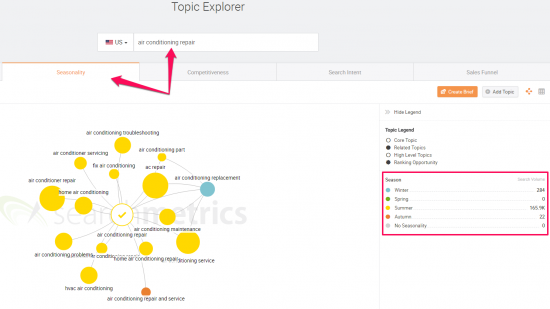 Now that we have some content and topic ideas based on the stage that our customers are at, we can start to dive deeper based on specific keyword segmentations. Let’s take a look at how to understand the needs of our customers and user intent with specific keyword segmentation. As you build out an SEO strategy around the needs of your customers, you will need to document how customers are searching and the type of keywords they are using to find your product or service. Here is a quick breakdown of the different types of search query segments that you should look at and how to optimize for each one in your online marketing strategy. Informational queries are broad searches made by a customer who is looking for general information on a topic. The best way to target these types of searches is to provide high-quality SEO content that provides excellent information about that topic. Write a series of blog posts and covers different aspects of a topic. This will allow each blog posts to focus on specific keywords and questions while also leaving a large footprint around a given topic. How-to videos are great at covering informational content since videos can deliver answers in a way that is easy to consume and your customers can follow along with. Large step-by-step guides are also excellent for informational queries because they are easy to follow for your readers and rank well in Google. Once your customers identify options for their needs through informational queries, they will likely begin looking for specific product/service brands. This is one of the hardest types of search queries to target, because unless you own an online store that sells particular names, then you will not come up with these brand-specific searches. Branded term search queries show clear user intent because they are included a specific brand when they go to search engines. Transactional search queries are used by customers when they are have done their research and isolated their options. Create informational product pages that contain keywords, helpful information, and event FAQs. This will help your products get found in search engines and align with the exact needs of your customers. Link all informational pages to your product pages using exact match keywords. Interlinking is a crucial component of content creation, and you can help boost your online rankings for specific keywords by linking from information pages to your product pages. Leverage PPC Advertising to help drive qualified traffic to your product pages. Since PPC is a direct-attribute marketing channel, you will be able to capture qualified leads at the moment they are ready to buy. 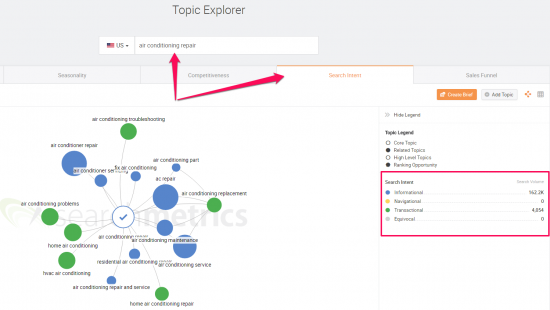 For the example of our air conditioning company, we should look at the different types of search queries based on segmentation of the keywords used. This information can help us produce and optimize better content for our marketing strategy. From the above results, we can see that the majority of content about air conditioning repair falls in the Informational and Transactional stages. This means that as we build content for the upcoming year, we should lean towards content based on these keywords for the different keyword segmentations. As we overlay this information with other elements, we can start to build fantastic content that will get results based on the stage that our customers are at. Below is a list of our content and topic ideas that we can plan as we layer on keyword segmentation into our marketing strategy. Seasonality is one of the essential elements to consider as you optimize your content and build out a marketing strategy. This is because your business is impacted by seasonal market shifts, regardless of your industry, customer base, or competition. Time-based: Seasons (winter, spring, summer, fall), Months (January, February, etc.). Event-based: Valentines Day, Small Business Friday, Cupcake Day, etc. Seasonal influences should be considered as you build out the overarching SEO strategy for our business. Taking seasonality into consideration will help us understand the content to use at specific times of the year to meet the needs of our customers as they search for solutions to their problems. For our air conditioning business, we know that our customers will need different services at different times of the year. Since the summer is the hottest time of the year, we know that our audience will be looking for air conditioner repair companies most in the summer because they will be using their air conditioning most often during that time of the year. Now that we understand the general needs of our customers, we can start to research the best keywords and craft content around their needs with Searchmetrics. 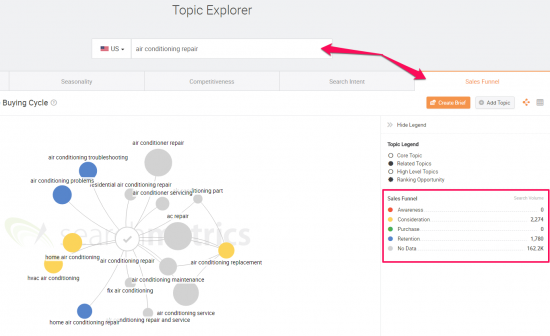 To do this, we will just enter the keyword phrase “air conditioning repair” into Topic Explorer and select the Seasonality tab. Using data, we can get an understanding of what keywords and topics that we should use based on the time of year. This information is valuable because we can start to build content with deep context. We can integrate the seasonal shifts and needs of our customers to understand the content they need. Here is the content and topic ideas that we have been creating with seasonality layered on top. As search engines continue to evolve, making content based on the needs of your customers will become increasingly important. Not only does this approach meet the business interest of search engines, but it also ensures that you save time and money by creating content that is valuable for your customers. Think about the customer journey, keyword segmentations, and seasonality as you develop an SEO strategy and content strategy for your business. Overlaying this type of information will not only help direct your content creation process, but it will also provide context to your plan. If you are struggling to create content that converts, then consider leveraging the power database provided by Searchmetrics to drive your SEO strategy today!